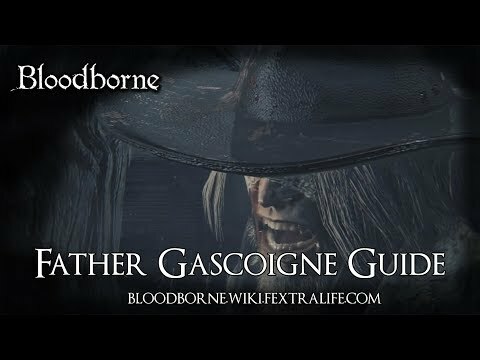 Father Gascoigne is a Boss in Bloodborne; he can also be summoned beforehand for a certain boss fight. 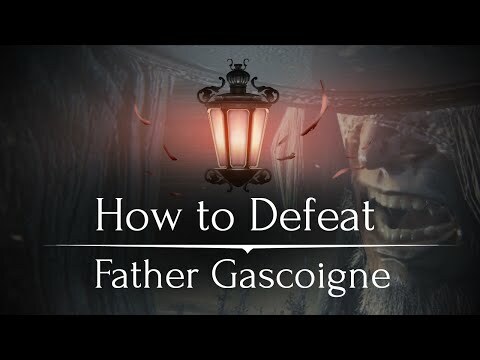 You can summon Father Gascoigne to help you fight the Cleric Beast boss encounter before you fight him at the Tomb of Oedon. Use the Old Hunter Bell at his summoning location near the fountain where the first Brick Troll is fought in Central Yharnam. He can be very helpful for clearing the bridge on your way to the Cleric Beast if you do not enter the bridge via a short cut from one of the linked houses. The Tiny Music Box item has a negative effect on Father Gascoigne in human and beast form. Using the item in close proximity to him causes him to stop attacking, instead clutching his head in pain and muttering to himself. This leaves him wide open to attacks. However, if you use it 3 times while he is still human, he will transform into a beast immediately, regardless of his health remaining. This boss fight is not optional as it's currently the only way to reach the Cathedral Ward. You gain 1 Insight for finding the boss, 1 Insight for seeing his beast form and 2 Insight for killing him. 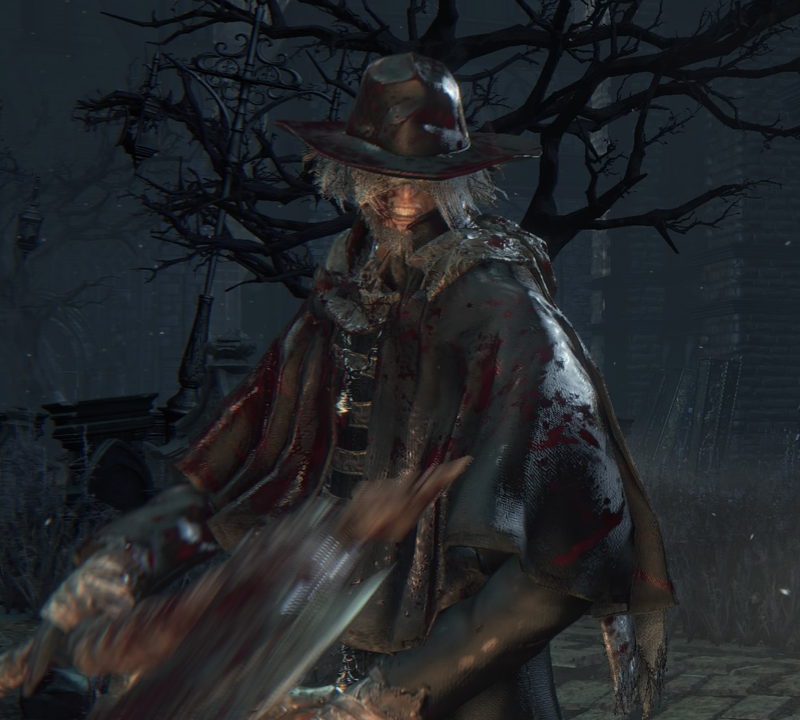 Father Gascoigne can be found at the end of Central Yharnam. You will need to clear or run by most of the sewers area, head up the ladder before or after the Maneater Boar, and make your way forward and left. Blood Echoes: NG (1,800), NG+(34,393), NG++ (37,832), NG+3 (42,991), NG+4 (51,589), NG+6 and so on (85,982). "Too Proud to show your true face eh? But what a sporting hunt, it was!" "What's that smell? ... The sweet blood, oh, it sings to me. It's enough to make a man sick"
Transforming his weapon has no impact on his ability to use his Blunderbuss. Father Gascoigne is weak to fire damage, both in human and beast form, and can be parried to open up visceral attacks against him. Molotov Cocktails can be effective in this fight, especially when he turns into a beast as his Fire RES decreases while in that form. Oil Urns can help further the damage caused by the fire. Keep in mind that Father Gascoigne is very agile, both as a human and beast, so you need to carefully time your throws. Remember that you can use the Tiny Music Box to stun him if you are having trouble. The fight has three phases. 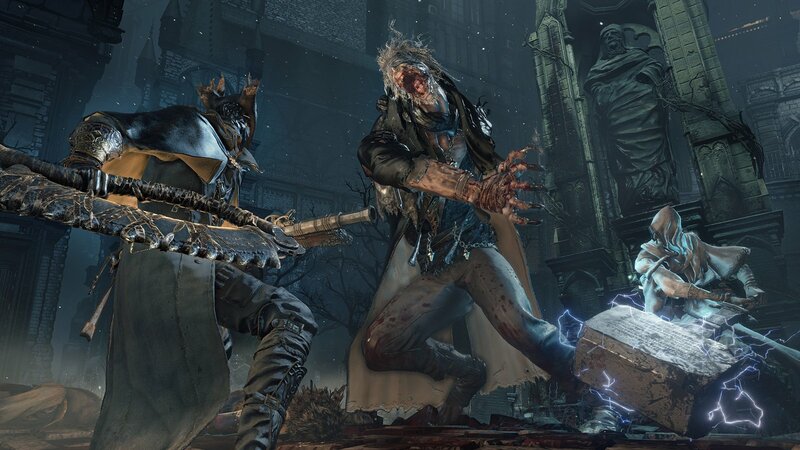 In the beginning, Father Gascoigne fights with a normal Hunter Axe and his unique Hunter Blunderbuss. 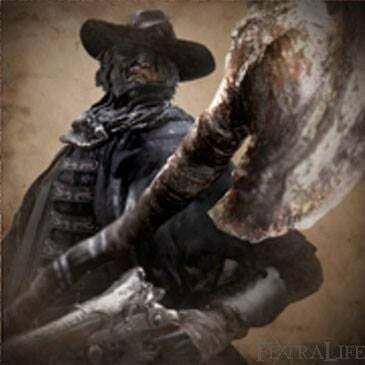 At roughly 75-80% health remaining, Father Gascoigne attacks you with a transformed Hunter Axe and his unique Hunter Blunderbuss, introducing charged and longer reaching attacks. When he reaches 50% or less, Father Gascoigne transforms into a beast, leaping and slashing at you quickly with his claws. This last portion can be challenging; make good use of the counter moves listed on this page. While human, Gascoigne can be knocked down and staggered by certain weapons/items. His beast form increases all of his defenses, except his fire resistance which drops further. During this form, he is considered a beast, and therefore vulnerable to Serration damage as a result. However, he gains considerable amounts of hyper-armor in this form as well. You can dodge forward and avoid it. You may also use the tombstones in the area to block the shots. You can dodge into or away from the swing to avoid damage. You may also use the tombstones in the area to put distance between you and attack. You can dodge away from it or parry it if your timing is good. Dodge away from it or use tombstones to block it. There is a good opening after he performs this attack. Used in phase 2 with transformed Hunter Axe. Dodge away from this attack. There is a good opening after he performs this attack. Dodge or roll towards him when he's about to pounce. Dodge away and attack from range. Dodge away and parry or attack from range. While in his human form, Gascoigne's search path is bad and he often tries to attack you even if there are tombstones between the two of you. As a result, he usually runs head first into the tombstone and misses his attack (His Blunderbuss will also be blocked by the tombstone as well). Use this to your advantage by baiting him to attack the tombstones and charge attack him while he's in recovery frames for 200-300 damage. It is also possible to get him stuck on one of the trees in the corners of the cemetery, leaving you the opportunity to hit him from the other side of the tree repeatedly until he transforms and then kill him. While in his beast form, Gascoigne will gain the ability to destroy the tombstones, making the above strategy obsolete. On the other hand, he will attack like a madman, giving tons of opportunity for you to stun him with your Firearm and perform a Visceral Attack on him. Keep a moderate distance from him by dashing backward and wait until he performed his multiple swipe attacks and shoot him in the face while he is slashing the air will net you multiple Visceral Attack opportunities, making him go down very fast. Use a weapon quicker than his axe. The Threaded Cane is ideal here, but other weapons will do. As soon as the battle starts, run for the stairs to the right, and conduct the entire fight on the stairs and the landing in front of the cathedral gate. The graveyard is a difficult place to fight with its erratic terrain and his arcing attacks. If you need space drop down from the landing and make the loop back up, healing as needed. In Phase 1, dodge to your left a lot, and away if you're not sure what he's about to do. Use the dodge attack whenever you can get away with it, but don't get greedy, even with the Threaded Cane, you can't hit him more than twice in a row before he'll use the Blunderbuss. He has trouble hitting you with the blunderbuss if you're on the stairs, as well. In Phase 2, his attacks become more linear, with a lot of overhead swings and rolling thrusts, except for the circular swing, which has a long windup so you have time to interrupt or get clear. You can dodge sideways more, but you still need to be careful. In his final phase, he's extremely quick, hits hard, and has a lot of reach. Try to save your bullets for him here. Try to get some distance and have an Oil Urn ready to throw, and then again try to get some ground and hit him with a Molotov Cocktail. Fight defensively, heal freely, and try to just burn him down. If you full clear Central Yarhnam 2-3 times depending on starting class you should be able to get enough blood echoes to get either strength or skill to 30 once there go into the boss fight and immediately head to your left into the open area keep Gascoigne away from the walls and gravestones then use the Tiny Music Box and rush him for a fully charged R2 to his back followed by a Visceral Attack doing this all 4 times that you are able will almost if not completely kill him making the entire fight take as little as 45 seconds to one minute. Nothing stops you from picking up the Red Jeweled Brooch during the boss fight. This does not change the quest in any way. In beast form, he becomes stronger, faster and more aggressive, at the cost of his sanity. However, later in the game multiple details come to light that some beasts, perhaps even all, still have a conscience, meaning their humanity isn't completely gone. It should also be noted that he is still affected by the Tiny Music Box even when he's become a beast, meaning his memories aren't completely gone as well. Regardless, his aggressive and insane nature leaves the Hunter no choice but to kill him before he goes further out of control. His equipment set reveals that his clothing had a "pungent beastly smell," indicating that his transformation had been slow and ate away at his humanity over time. Even though his equipment set is actually above-average when dealing with fire damage, Father Gascoigne is still weak against fire damage. This is an indicator of just how far the beast plague has taken its toll on Father Gascoigne; he's become more beast-like over time. In the Alpha version, he muttered "Umbasa" upon killing the player, a reference to one of From Software's games, "Demon's Souls". 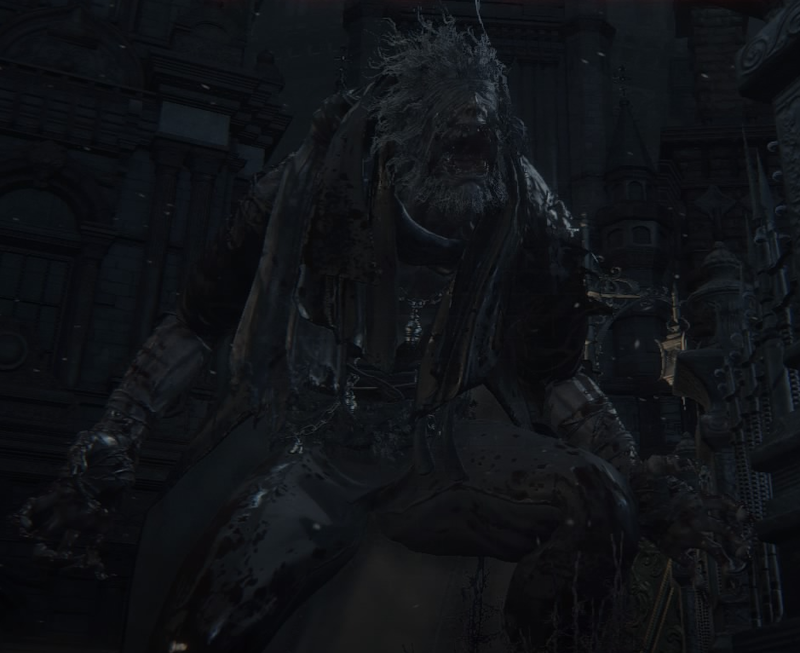 If you summon Father Gascoigne for the Cleric Beast boss fight and you happen to have the Tiny Music Box, using it will make Father Gascoigne give you an unimpressed grunt or a small chuckle. Gascoigne's surname is based off from Irish origin. His dialogue, "beasts all over the shop" is also based off from an Irish colloquialism. There is a very rare glitch where Gascoigne duplicates himself upon transforming, leaving his human form standing inert where he transformed and his beast form acting as normal. Hitting either will damage his health bar, meaning one player can distract the beast form while another hits the defenceless human form. Oddly enough, Father Gascoigne actually carries the Hunter Pistol, although it behaves like a Hunter Blunderbuss. Also, Gascoigne can use his firearm even while his axe is transformed. Normally players cannot use firearms when the Hunter Axe is transformed, giving Gascoigne a unique characteristic amongst many Hunters and Old Hunters. When transformed he only has 4 toes. Makes the same sound as Pus of Man (Dark Souls 3) does when he/it transforms.